PRICED AT LOT VALUE - WATERFRONT BUNGALOW WITH OPEN WATER VIEWS. This 3 bedroom 3 bathroom home of 1719 sq ft is waiting with a beautiful pool and 60 ft of water frontage. Upon entering you are greeted by an expansive combination dining/living great room with a wall of picture windows looking out to the calm waters of a large bay. A huge master bedroom suite also takes full advantage of the open water views with three walls of windows and sliders. A second master bedroom suite has water views en suite bathroom and walk-in closet. The third bedroom shares a guest bathroom with the common areas of the home. 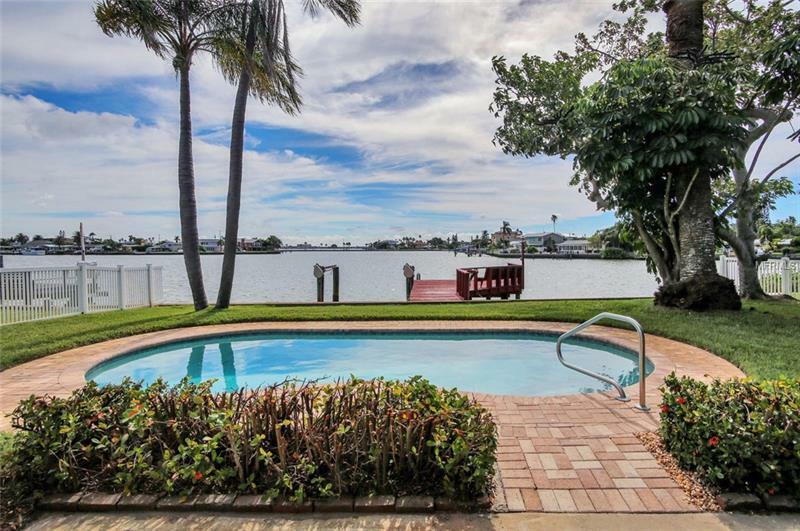 A large lushly landscaped yard with fruit trees a refreshing pool and private deep water dock awaits for boating fishing entertaining or simply relaxing and watching the dolphins play. Recent updates to this waterfront home include a newer roof (2015) and Trane AC (2014). Just a short walk to the beach or an enjoyable boat ride to open Gulf waters 16313 Redington Dr is perfectly located in the quaint beach town of Redington Beach 45 mins from Tampa Int’l Airport & less than 2 hrs from Orlando theme parks.